1. What is the genetic code? The genetic code is the key for the conversion of DNA nucleotide sequences (and therefore RNA nucleotide sequences) into the amino acids sequences that compose proteins. 2. Which molecule contains the genetic information that is transmitted hereditarily and which controls cellular function? The hereditary molecule that controls cellular function is DNA (deoxyribonucleic acid). DNA contains information for protein synthesis in cells. 3. How are the concepts of DNA, genes, proteins and the characteristics of living organisms related? The characteristics of organisms depend on the chemical reactions that occur inside them. These reactions are catalyzed by enzymes, which are highly specific proteins. Every protein of an organism is made from information contained in RNA molecules, which are made according to a template based on a sequence of nucleotides of a DNA chain. A gene is a DNA polynucleotide sequence that contains information for the production of a protein. 4. What is the role of messenger RNA and ribosomes in protein synthesis? Messenger RNA (mRNA) is produced within the nucleus of a cell and migrates to the cytoplasm, where it attaches to ribosomes and guides the building of the amino acid sequences that will compose proteins. Ribosomes are sites for the meeting and binding of mRNA and transfer RNA (tRNA). They are the structures where amino acids transported by tRNA are united by peptide bonds to form polypeptide chains (proteins). 5. What subunits make up ribosomes? Ribosomes are made of two subunits, the small subunit and the large subunit. These subunits are made of ribosomal RNA (rRNA) and proteins. Ribosomes have three binding sites, one for mRNA and two for tRNA. 6. How different is the location of ribosomes in eukaryotic and in prokaryotic cells? In prokaryotes, ribosomes are found free in cytoplasm. In eukaryotic cells, they can also be found free in cytoplasm, but are mainly attached to the external membrane of the karyotheca and the rough endoplasmic reticulum. 7. How is the presence of ribosomes inside mitochondria and chloroplasts explained? A well-supported hypothesis states that mitochondria and chloroplasts were prokaryotes that developed a relationship of mutualism with eukaryotic cells (gaining protection and offering energy). This explains why these organelles contain DNA and protein synthesis machinery, including ribosomes. This hypothesis is known as the endosymbiotic hypothesis on the origin of mitochondria and chloroplasts. 8. What are some examples of human cells that produce proteins for exportation? Which cytoplasmic organelle must be well-developed and abundant in those cells? Specialized cells of glands, such as the Langerhans cells of the pancreas (which produce insulin) or saliva-producing cells, are examples of secretory cells. In cells specialized in secretion, the endoplasmic reticulum and the Golgi apparatus are well-developed, since they participate in the storage and processing of proteins for exportation. 9. Which ribosomes are the more abundant in secretory cells, the ribosomes free in the cytoplasm or those attached to the rough endoplasmic reticulum? The ribosomes free in the cytoplasm are more related to protein production for internal cellular consumption whereas those attached to the rough endoplasmic reticulum are more important in protein synthesis for exportation. Proteins made by attached ribosomes enter the rough endoplasmic reticulum and are later transferred to the Golgi apparatus. Therefore, in secretory cells, ribosomes attached to the endoplasmic reticulum are more abundable. 10. Where in eukaryotic cells does mRNA synthesis occur? Where do these molecules migrate to? Messenger RNA molecules are synthesized within the nucleus, pass through the pores of the nuclear membrane and enter the cytoplasm to reach the ribosomes where protein synthesis occurs. 11. Given that it is based on information from mRNA, what is the process of protein synthesis called? Protein synthesis is called translation (of genetic information into proteins). 12. What is the difference between transcription and translation? 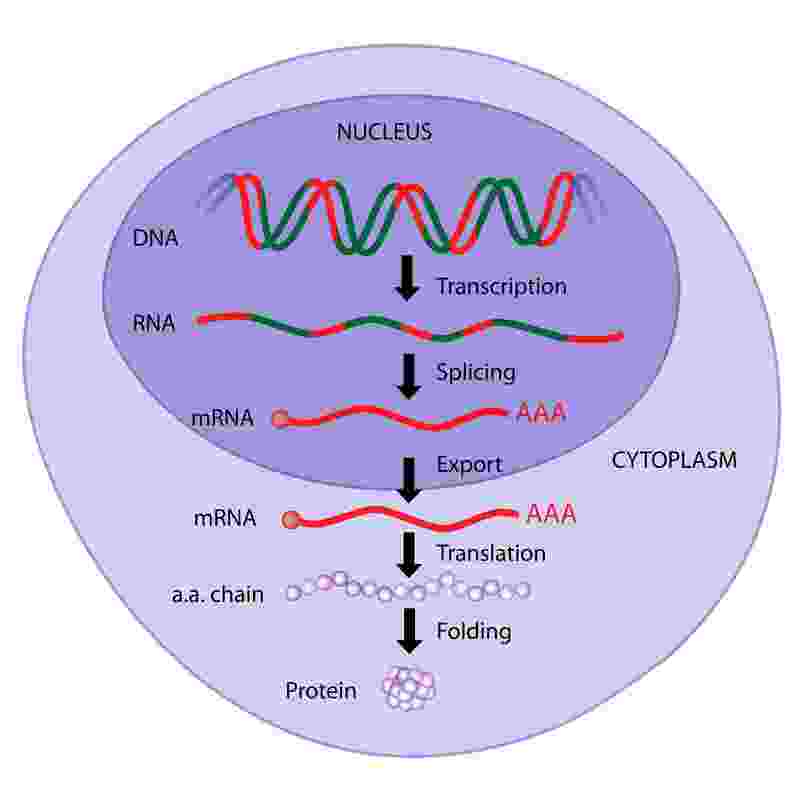 Transcription is the name given to the formation of RNA molecules from an open DNA chain used as a template. Translation is the creation of polypeptides (amino acids bound in sequence) and therefore of proteins based on information encoded in the mRNA molecule. In eukaryotic cells, transcription occurs in the nucleus and translation occurs in ribosomes. Transcription precedes translation. 13. How do the nucleotides of mRNA chains encode information for the formation of the amino acids sequences of a protein? There are only four types of nitrogenous bases that can compose RNA nucleotides: adenine (A), uracil (U), guanine (G) and cytosine (C). However, there are 20 different amino acids. With only one nucleotide (a 1:1 coding), it would be impossible to codify all the amino acids. With two nucleotides, there would be an arrangement of 4 elements, 2 x 2, resulting in a total of only 16 possible codifier units (4 x 4). Nature may know combinatorial analysis, since it has created a genetic code by arranging the 4 RNA bases, 3 x 3, providing 64 different triplets (4 x 4 x 4). Therefore, each triplet of nitrogenous bases of RNA codifies one amino acid of a protein. As these triplets appear in sequence in the RNA molecule, sequential amino acids codified by them are bound together to make polypeptide chains. For example, a UUU sequence codifies the amino acid phenylalanine, as well as the UUC sequence; the ACU, ACC, ACA and ACG sequences codify the amino acid threonine; and so on for all possible triplet sequences and all other amino acids. 14. What is the name of an RNA sequence that codifies one amino acid? Each sequence of three nitrogenous bases of RNA that codifies one amino acid is called a codon. The codon is the codifier unit of the genetic code. 15. Given that out of the 64 codons of mRNA, 61 codify amino acids that form polypeptide chains, what are the functions of the three remaining codons? Since there are 20 amino acids and 64 possibilities of mRNA codons, some amino acids codify more than one codon. However, not all 64 codons however codify amino acids. Three of them, UAA, UGA and UAG, transmit the information that the last amino acid of the polypeptide chain has been bound, signaling the end of the polypeptide synthesis. These codons are called stop codons. The codon AUG codifies the amino acid methionine and, at the same time, it signals the beginning of the synthesis of a polypeptide chain (it is a start codon). In prokaryotic cells, there is a sequence called the Shine-Dalgarno sequence (in general AGGAGG) in the position before the start codon AUG. The function of this sequence is to distinguish the start codon AUG and the other AUG codons of the RNA. 16. To which cellular structure do mRNA molecules bind to start protein synthesis? To make proteins, mRNA molecules have to attach to ribosomes. Ribosomes have two sites for the binding of two neighboring mRNA codons and where anticodons of tRNA bind by hydrogen bond. Therefore, ribosomes are the structure responsible for the positioning and exposure of mRNA codons to be translated. In ribosomes the peptide bond between two amino acids brought by tRNA molecules also occurs. The peptide bond happens when tRNAs molecules carrying amino acids are bound to exposed mRNA codons. 17. How are amino acids brought to the sites of the cell where translation takes place? What is an anticodon? Amino acids are brought to ribosomes by RNA molecules known as transfer RNA, or tRNA. One tRNA attached to its specific amino acid binds by a special sequence of three nucleotides to an mRNA codon exposed in the ribosome. This sequence in the tRNA is known as an anticodon. The tRNA anticodon must be complementary to the mRNA codon to which it binds, according to the rule A-U, C-G. The ribosome then slides along the mRNA molecule (a process called translocation) to expose the following codon for the binding of other tRNA. When amino acids corresponding to neighboring codons bind by peptide bond, the first tRNa molecule is released. 18. Why is the proximity between ribosomes and amino acids important for the formation of proteins? What is the enzyme that catalyzes that reaction? The proximity between ribosomes and amino acids is important because the enzyme that catalyzes the peptide bond resides in ribosomes. As substrates of these enzymes, amino acids need to bind to the enzyme activation centers. The enzyme that catalyzes the peptide bond is peptidyl transferase. 19. Why do ribosomes move along mRNA during translation? During translation, the ribosome always exposes two mRNA codons to be translated by moving along the mRNA. When a peptide bond is made, the ribosome moves to expose the next codon. This movement is called ribosomal translocation. (In the rough endoplasmic reticulum, ribosomes are attached outside the membrane and mRNA molecules move through them). 20. How many of the same proteins are made at the same time by each ribosome during the translation of one mRNA molecule? How does consecutive protein production occur in translation? Ribosomes do not make several different proteins simultaneously. They make them one after another. However, many ribosomes may move along one mRNA molecule, mass manufacturing the same protein. The unit made of many ribosomes working on the same mRNA molecule is called a polysome. 21. Does an mRNA molecule codify only one type of protein? Eukaryotic cells have monocistronic mRNA, meaning that each mRNA codifies only one polypeptide chain. Prokaryotes may present polycistronic mRNA. After assembling amino acids into a polypeptide chain, the mRNA, through one of its stop codons, signals to the ribosome that the polypeptide is complete. The ribosome then releases the produced protein. In prokaryotes, after this process is finished, the information on the beginning of the synthesis of another different protein may follow in the same mRNA molecule. 22. If a tRNA anticodon is CAA, what is its corresponding mRNA codon? In the genetic code, which amino acid does this codon codify? According to the A-U, C-G rule, the codon which corresponds to the CAA anticodon is GUU. The genetic code table for translation is based on codons and not anticodons. The amino acid codified by GUU, according to the genetic code, is valine. 23. If a fragment of nucleic acid has a nucleotide sequence of TAC, is it a codon or an anticodon? A nucleic acid fragment with a TAC sequence is surely not tRNA. It is DNA because RNA does not contain the nitrogenous base thymine. Since it is not RNA, it cannot be a codon or an anticodon. 24. Why can the genetic code be called a “degenerate code”? The genetic code is a degenerate code because some amino acids are codified by more than one type of codon. It is not a system in which each element is codified by only one codifying unit. For example, the amino acid arginine is codified by six codons: CGU, CGC, CGA, CGG, AGA and AGG. 25. What is the concept of the universality of the genetic code? What are the exceptions to this universality? The genetic code is universal because the rules of protein codification based on mRNA codons are practically the same for all known living organism. For example, the genetic code is the same for humans, bacteria and invertebrates. however, protein synthesis in mitochondria, chloroplasts and some protozoa are accomplished through different genetic codification. 26. How does the universality of the genetic code make recombinant DNA technology possible? The universality of the genetic code refers to the fact that the protein synthesis machinery of all living organisms function according to the same principles of storage, transmission and information recognition, including the translation of mRNA codons. This fact makes the exchanging of genes or gene fragments between different organisms possible and ensures that these genes continue to control protein synthesis. This universality, for example, makes the insertion of a fragment of human DNA containing a gene for the production of a given protein into the genetic material of bacteria feasible. Since bacterial transcription and translation systems work in the same way as corresponding human systems, the bacteria will begin to synthesize the human protein associated with the inserted DNA fragment. There exist industries that produce human insulin (for use by diabetics) in this way, synthesized by bacteria with modified DNA. If the genetic code were not universal, this kind of genetic manipulation would be impossible or very difficult to accomplish without new technological advancements. Study the next subject: go to Bacteria.